Tallinn, Estonia. August 17 and 18. "geopolitics of media", "critical interdisciplines", "wearable experience". The context for the conferences in Tallinn, coordinated by the Estonian Mare Tralla, was possibly the most important part at a sociocultural level. 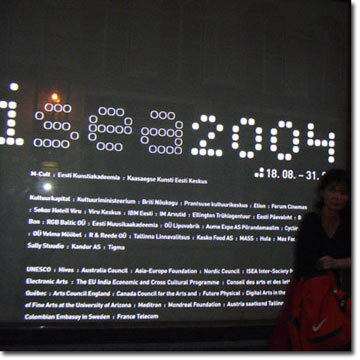 ISEA2004 is the biggest cultural event organized between Estonia and Finland (countries which, among other things, share the roots of their languages) since Estonia’s becoming part of the European Community. It is worth remembering that Estonia was part of the Soviet Union only 15 years ago, and for this reason, it is one of the places where it is easiest to see the profound changes affecting contemporary Europe. In the midst of this stimulating arena were conferences and exhibitions relating to the subject of the "geopolitics of media". Among the works on show, it is worth highlighting "M.O.L." by the Indian Shilpa Gupta, who had received one of the awards from the previous Transmediale. Her work offered a system to create fictitious commercial product labels which could then be placed in shops and supermarkets. Diane Ludin, Hans Zaunere and Ricardo Dominguez from the US took part with "I-BPE version 2.0", a project that questions the logic of the complex world of biological patents. The Quiasma Group from Colombia, made up of Clemencia Echeverri, Bárbara Santos and Andrés Burbano, exhibited an interactive DVD that operated as a cultural interface for the different forms of celebration, underscored with tension, seen in their country. The participation of the Sarai Media Lab Group from India was particularly significant, with their proposal "The network of no_des". Sarai’s work was to have a wide-ranging and profound influence on the whole festival on many levels. Subsequently we found out that this "intelligent collective" would be the grand winner of the UNESCO Digital Arts award. Alongside these subjects, there was also a "fancier" side to the event, with a series of lectures, exhibitions and fashion shows relating to wearable technology. A provocative subject, though it was obvious that there was a good deal of speculation surrounding the work being carried out on this technology, which looks at the design of new clothing systems linked to portable and wearable technological processes. However, events such as the fashion show did act as a conceptual counterpoint to the "geopolitics of media.